Eugène Delacroix (1798–1863), Erminia and the Shepherds (detail) (1859), oil on canvas, 82 x 104.5 cm, Nationalmuseum, Stockholm, Sweden. Wikimedia Commons. The seductive ‘pagan’ sorceress Armida has just told Godfrey of Bouillon, leader of the First Crusade’s siege on the city of Jerusalem, a long sob story, leading to her request for ten of his best knights to go and sort her problems out. Godfrey predictably turns her down, in view of his mission to deliver the city. Armida plays on emotion, and weeps. She has won over the young knight Eustace, who asserts that helping all ladies is chief among the duties of a knight. The others around Godfrey concur, and their leader is forced to acquiesce. Armida then plays the field with great skill and success, winning over the hearts of all the knights, in her bid to take away more than just the ten that she asked for. Canto five continues in the camp of the crusaders, with Armida’s influence eating away at their resolve to fight. Godfrey’s next problem is to select a knight to replace the dead Dudon, who in turn can choose the ten to go with Armida. This sows dissent, with Prince Gernando wanting to lead the army of ‘Adventurers’. This brings him into direct conflict with Rinaldo, who accuses Gernando of being a liar. The two knights must settle this immediately in combat, and Rinaldo quickly kills Gernando. Godfrey goes straight there, and on hearing what happened, condemns Rinaldo to death for breaking the crusaders’ laws. Tancred speaks in favour of Rinaldo, then Raymond too. Tancred rides off to Rinaldo’s tent, and the latter makes clear that he has no intention of staying around in prison awaiting his trial. Rinaldo dons his armour, and rides off. Guelph goes to Godfrey to plead Rinaldo’s case, but the leader stands firm. Next, Godfrey has to face Armida, who goes to him with two of her ladies and two knights in attendance. With Godfrey’s single-minded determination in his mission, she finds him much less malleable than his knights. Armida finally gets her way, and is allowed to take her ten knights. With dozens of knights clamouring to accompany Armida, it is decided to draw names from an urn. Tasso lists: Count of Pembroke Artemidorus, Gerard, Wenceslaus, Guasco, Rudolph, Olderic, William of Roncillon, Bavarian Eberard, French Henri, and Rambaldo. Those who were unsuccessful are left seething in envy, and many leave the following night to follow Armida as she leads her squad of ten knights away. This further divides the force of crusaders. Back in camp, Godfrey hears that an Egyptian navy is at sea to prevent supply ships reaching the coast, and that a convoy of supplies en route to the crusaders from one of the ports has been ambushed and lost. The leader has to comfort his men by affirming that God will look after them, but inwardly worries how he will feed the army. The sixth canto starts inside the besieged city of Jerusalem, where its occupants are better-fed than those laying siege to it, because they have been able to bring in supplies by night. Work had been undertaken to strengthen its fortifications, particularly on the north, where there were war machines stationed too. Argante urges Aladine to fight the enemy rather than sit waiting for starvation, but the ruler reveals that Soliman of Nicaea, who seeks vengeance for his own loss earlier in the Crusade, is gathering a force to attack by night. This angers Argante, who is an old rival of Soliman, and he asks permission to go out to meet a crusader in combat. Aladine gives his consent. Argante then issues a challenge to Godfrey for one-to-one combat, which the latter cannot refuse. Inside the city, Aladine instructs Clorinda to take a force of a thousand to ensure Argante’s safe passage. Godfrey feels unable to choose Argante’s opponent, but the consensus calls on Tancred, who is approved by Godfrey. 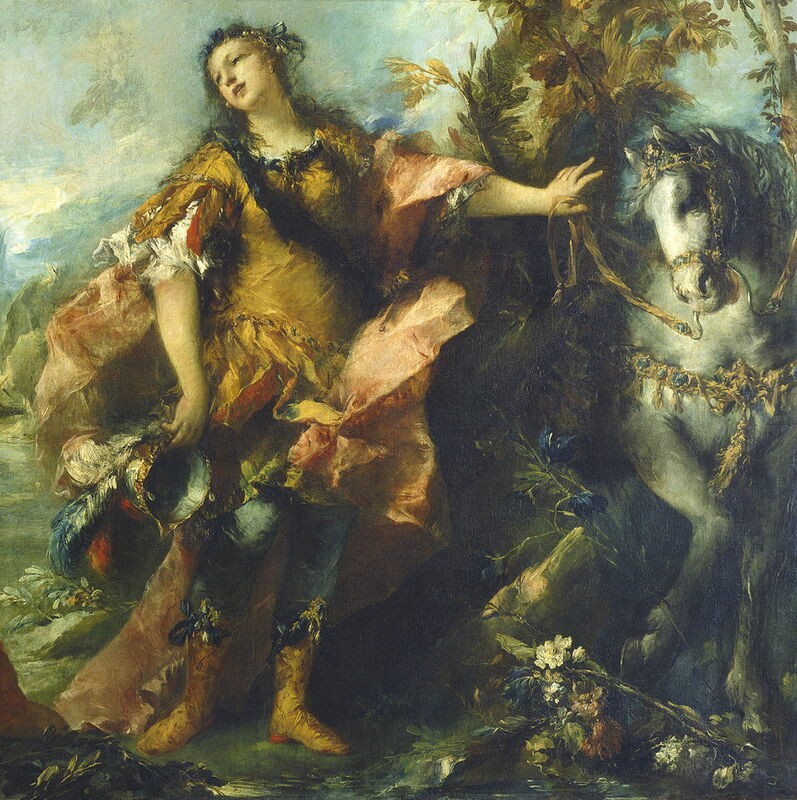 As Tancred makes his way to the field where they will fight, he sees Clorinda, who sits on her horse with her visor raised. This delays him, and Otto has already rushed forward to take on the Circassian in the arena. Otto is in full charge before Tancred realises what is happening. Otto and Argante make contact: although Otto strikes the Circassian’s helmet, the latter knocks Otto from his horse, cleaving his shield and breastplate. Argante tells Otto to concede, but the crusader refuses. Argante charges at Otto, who manages to wound his enemy and draw blood, but insufficient to do anything more than anger him further. Argante then turns his horse, fells Otto, and his horse tramples him, in a cowardly act which breaches the code of chivalry. At this, Tancred calls out Argante’s cowardice and the two charge at one another. Their lances shatter, making their horses collapse from under them. They draw their swords to fight on foot. Tancred is the first to draw blood, and Argante is so stunned that he is too slow to return the strike, and takes another heavy blow to his shoulder. Argante’s rage then overcomes his injuries, and he rains blows on Tancred. Both are now wounded, their armour pierced in many places. At this point, heralds are put in to bring the vicious fight to a halt for the night. Erminia, in Jerusalem behind them, has suffered this battle badly. When Antioch fell, it was Prince Tancred who had protected her, and honoured her as a queen. For this, she had fallen in love with him. As she watched Tancred in combat, she had felt every blow which Argante had laid on him. With her skills in preparing healing potions, she is torn between using them to nurse her love, or Argante who would surely then be able to finish the crusader off. 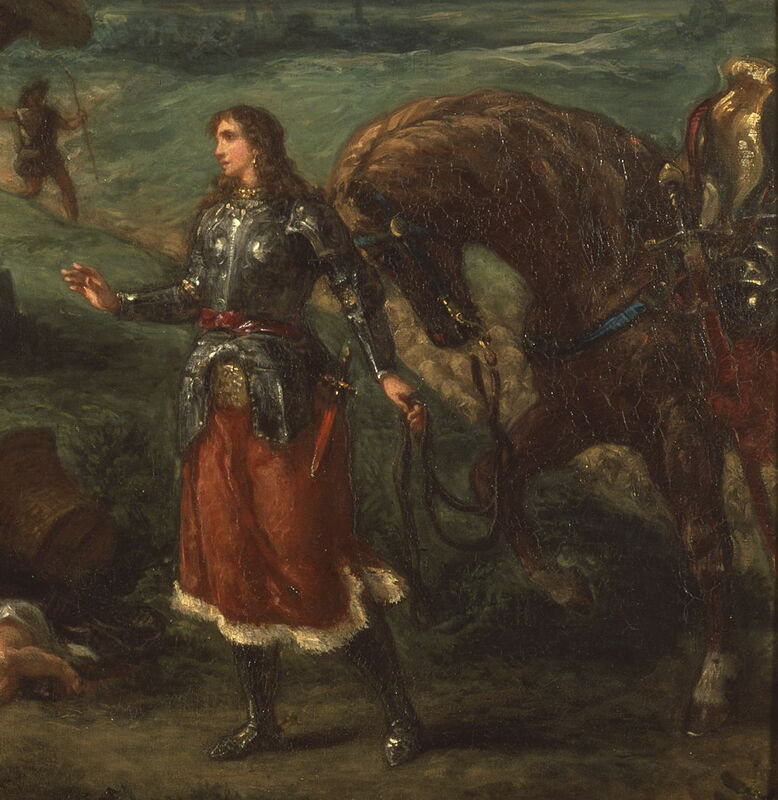 She had spent long hours with Clorinda, and decides to dress up in her armour so that she can leave the city and give aid to Tancred in the crusaders’ camp. She engages the help of a trusty squire and her maid, although she doesn’t tell them where she is going to. Erminia then plays the part of Clorinda, commanding that the city gate is opened on the authority of its king. Once near the camp, she realises that her plan has one problem: being recognised as Clorinda, woman warrior of Aladine’s forces, probably won’t give her a good reception among those laying siege to the city. She therefore sends her squire on to locate the injured Tancred. As she waits for his return, she is spotted by a platoon who are there to intercept attempts to smuggle supplies into the city. The father of one of its leaders, Polyphernes, had been killed by Clorinda, so throws his spear at her, and misses. 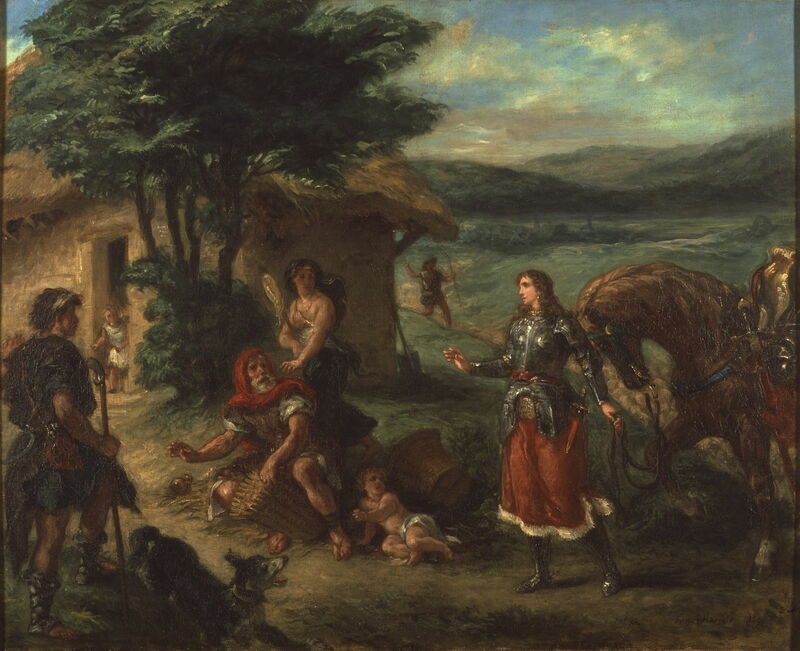 Erminia flees in panic, with her maid, and later the squire. When Tancred hears of this, he rides off in pursuit of the woman warrior identified to him as Clorinda. At the start of the seventh canto, Erminia enters dark woods – this is also still night – and continues her flight, even though those pursuing her have now given up and returned to camp. The following day, she continues to wander, lost until she reaches the River Jordan, where she lies down to sleep, completely exhausted. When she wakes at the next dawn, she sees that there is a small shepherds’ hut, and weeps, only to hear the sound of shepherds singing and playing their pipes. She gets up and walks towards the group, which consists of a grey-bearded man and three youths. As she is still wearing Clorinda’s armour, they are fearful of her at first, but she explains what is going on nearby, asking how they can remain there in peace. The old man explains that he had been the keeper of the grounds and member of the royal court at Memphis, but had left for the peaceful life with his three sons in the country. He consoles her, and takes her to his elderly wife, who dresses her in country clothes. 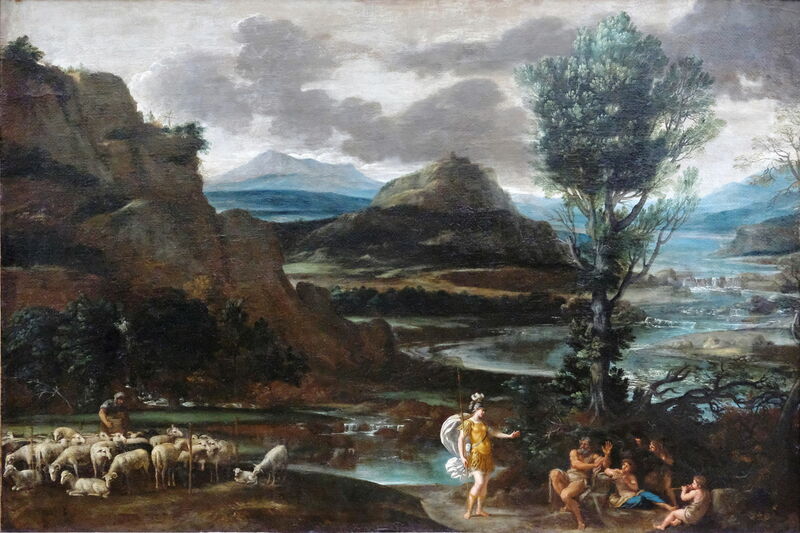 Domenichino (1581–1641), Erminia and the Shepherds (1622-25), oil on canvas, 124 x 181 cm, Musée du Louvre, Paris. Image by Mbzt, via Wikimedia Commons. Domenichino appears to have been one of the earliest major painters to capture this scene, in his Erminia and the Shepherds, painted between 1622-25. He recasts the story in classical times, with Erminia appearing more Roman than Syrian, and the shepherds are straight out of an Ovidian myth. This is all set in a wonderfully imaginative riparian landscape. 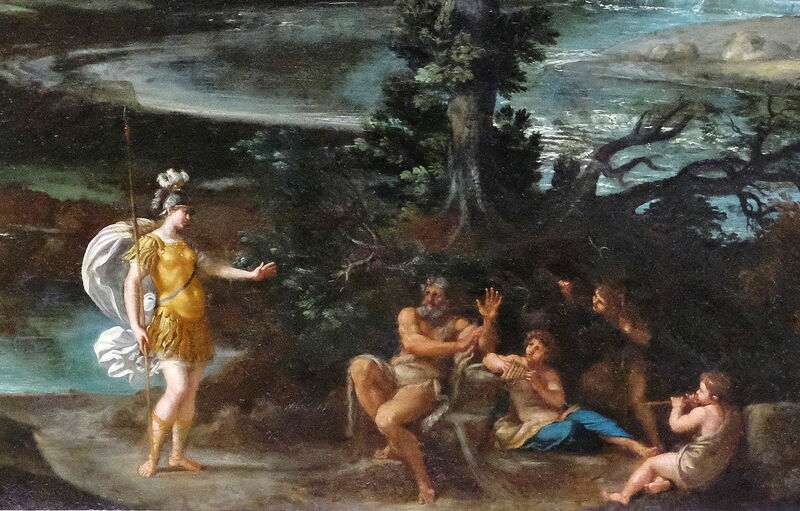 Domenichino (1581–1641), Erminia and the Shepherds (detail) (1622-25), oil on canvas, 124 x 181 cm, Musée du Louvre, Paris. Image by Mbzt, via Wikimedia Commons. Giovanni Antonio Guardi (1699–1760), Erminia and the Shepherds (1750-55), oil on canvas, 251.5 x 442.2 cm, The National Gallery of Art, Washington, DC. Wikimedia Commons. 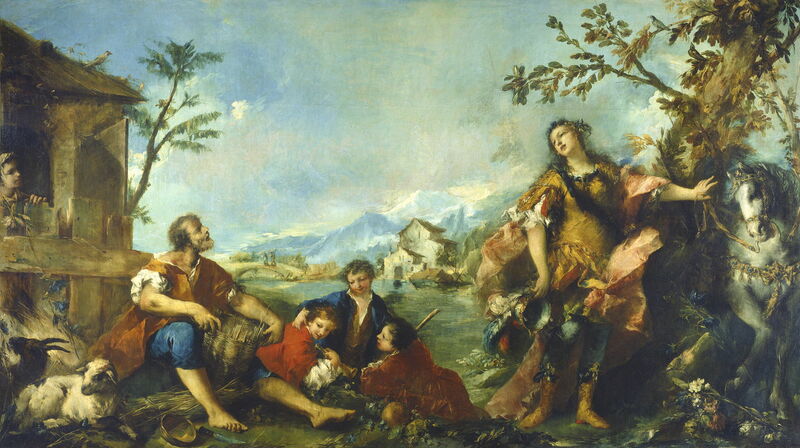 This sub-plot remained popular through the eighteenth century, when Giovanni Antonio Guardi painted his interpretation of Erminia and the Shepherds (1750-55). Erminia has by now changed out of Clorinda’s armour into the fetching outfit of an Alpine shepherdess. She stands holding the reins of her white horse, and Clorinda’s helmet. Giovanni Antonio Guardi (1699–1760), Erminia and the Shepherds (detail) (1750-55), oil on canvas, 251.5 x 442.2 cm, The National Gallery of Art, Washington, DC. Wikimedia Commons. 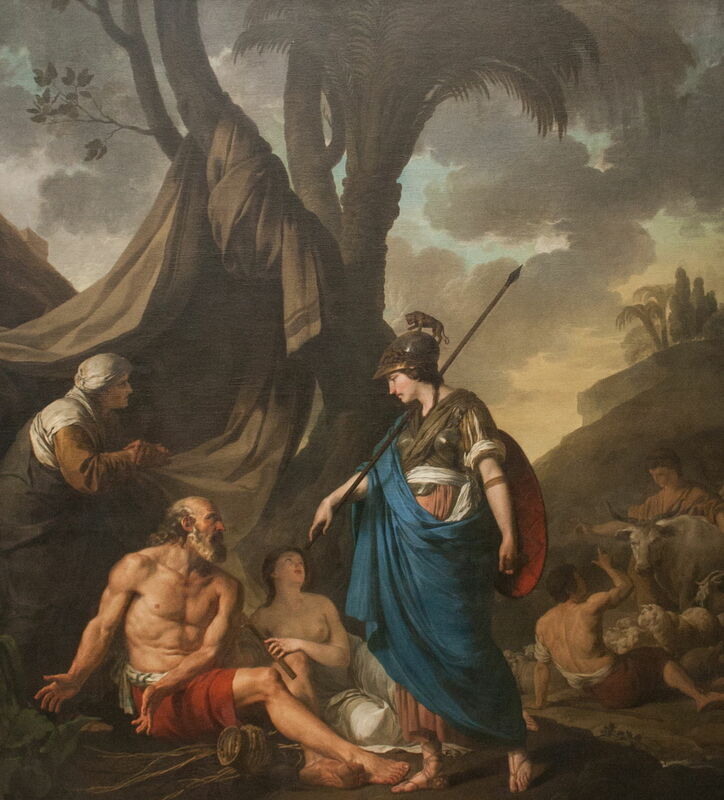 Joseph-Benoît Suvée (1743–1807), Erminia and the Shepherds (1776), oil on canvas, dimensions not known, Museum voor Schone Kunsten, Ghent, Belgium. Wikimedia Commons. Joseph-Benoît Suvée’s Erminia and the Shepherds from 1776 is more basic and a little less literal. Her horse is nowhere to be seen, and the semi-naked young woman sat next to the old shepherd is something of a surprise. The setting is a bit more Palestinian, though, with some palm trees. Eugène Delacroix (1798–1863), Erminia and the Shepherds (1859), oil on canvas, 82 x 104.5 cm, Nationalmuseum, Stockholm, Sweden. Wikimedia Commons. It is perhaps Eugène Delacroix who renders this most faithfully, in his Erminia and the Shepherds of 1859. Erminia is still dressed as the warrior Clorinda, and her charger is convincing too. The farming family are taken aback, and their dog has rushed out to bark at the visitor. In the distance, behind the small farmhouse, is a figure who might be pursuing Erminia. Although Tancred had also strayed, he is still in pursuit of the warrior who he thinks is Clorinda. Posted in General, Life, Painting and tagged Crusade, Delacroix, Domenichino, Guardi, history, Jerusalem, mediaeval, narrative, painting, Suvée, Tasso. Bookmark the permalink.